Honor Note 10 Launch Teaser Released - Playfuldroid! In the previous week, Honor President Zhao Ming had confirmed on the existence of the Honor Note 10 smartphone. He had also revealed that the company has been working on since the past two years. Huawei’s sub-brand has now released a new teaser to confirm that its launch event will be held in Beijing, China. The above poster only confirms the launch venue for the Honor Note 10. So, the launch date of the smartphone is not known yet. 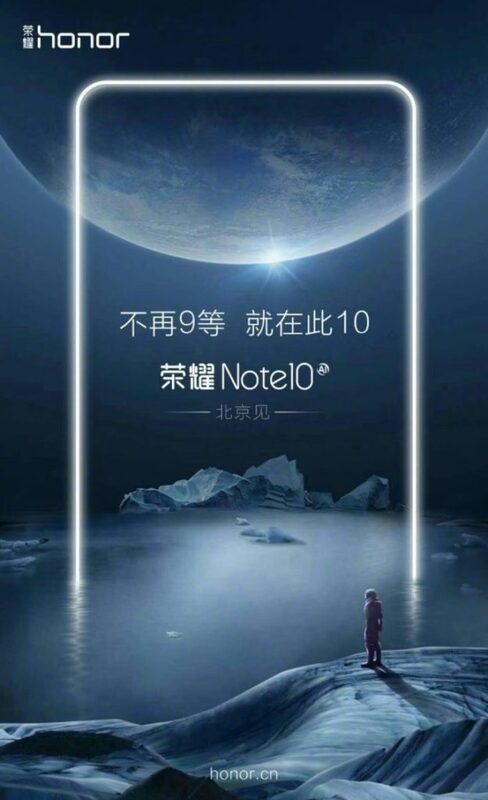 The above image clearly mentions that this phone will be called Note 10 as it done with the Honor 9 series. There is no information available on the specifications of the Note 10. It is only known that the handset is codenamed as Ravel and it features a 6.9-inch S-AMOLED screen. Leaked photos of the phone that had revealed its rear side had shown that it features a glass back with vertical dual cameras followed by a fingerprint reader. The Kirin 970 SoC is expected to power the smartphone. Now that the company has officially started teasing on the arrival of the Honor Note 10, it appears that the smartphone may go official by the end of this month or early August. A Chinese leakster had claimed in the last week that its launch date will coincide with Samsung’s Galaxy Note 9 that is slated to go official on Aug. 9.